This is my final report from the Testing Dojos at the Belgium Testing Days. Over all there have been roughly ten different persons attended in one mission or the other. We ran about eight missions in two days. 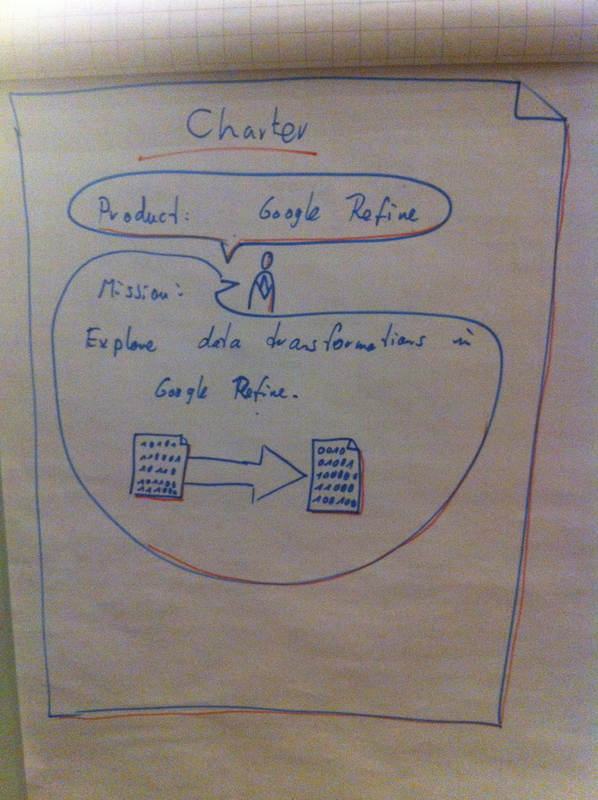 On the first day we started with Google Refine, in the morning on the second day we had a look on Mind Mapping tools, at noon tackled a planning wizard, and finished in the afternoon with some exploratory note-taking tools. I learned a lot, and I hope so did the participants. On the first day, I had one other attendee to the Testing Dojo. 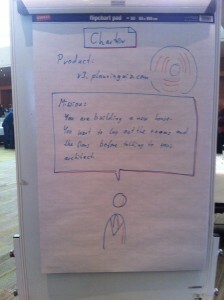 I gave him a brief explanation using Visual Facilitation, and we started out the session using Inspectional Testing. We got a quick overview of the available functionality, and started to set up charters for the remainder of the day during the debrief after roughly 45 minutes. Since we found some bugs during data import, we had two narrow charters up for our next timebox, and started over nearly instantly. 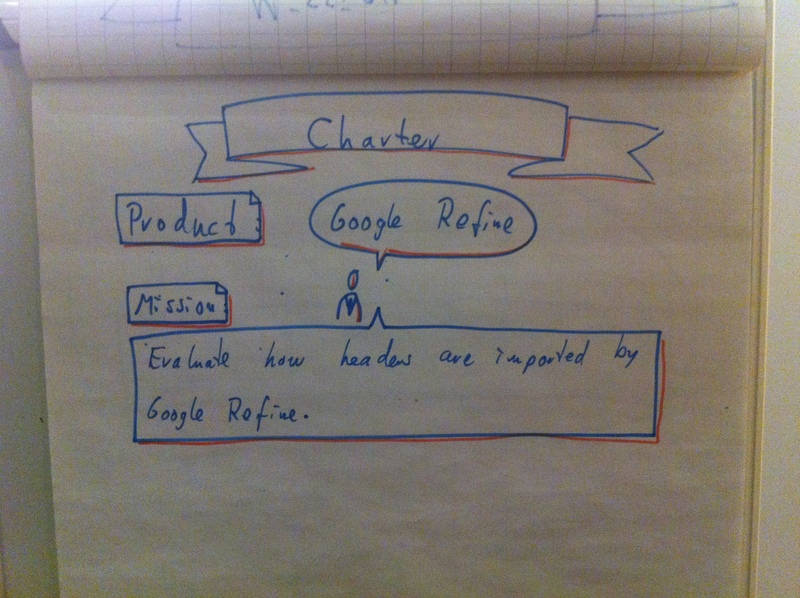 When Lisa Crispin joined us I suggested that Google Refine might be up able to refactor FitNesse tests, and we setup a charter to explore this ability. Unfortunately we couldn’t get this going in the time we set aside to explore it, and gave up in the end, as we couldn’t find out how to do that. We also had some trouble configuring the right things. We concluded that there might be potential, if the descriptions would be more clear. After all the first day was very interesting, but we doubted the maturity of Google’s Refine heavily after playing with it for just half a day. We found some bugs for the import feature, and also for different data types. However, we didn’t explore the more advanced functionalities like facets and transformations enough from my perspective to make a valid case pro or against the product. The information we got so far made me suspicious about the product, however. Inspired by a blog entry from Darren McMillan I decided to use the first half of the second for mind mapping tools and approaches. 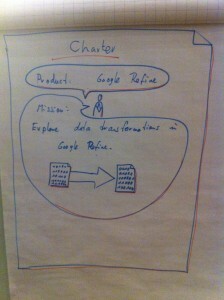 I prepared a mission to explore three different mind mapping tools for three different potential user groups. 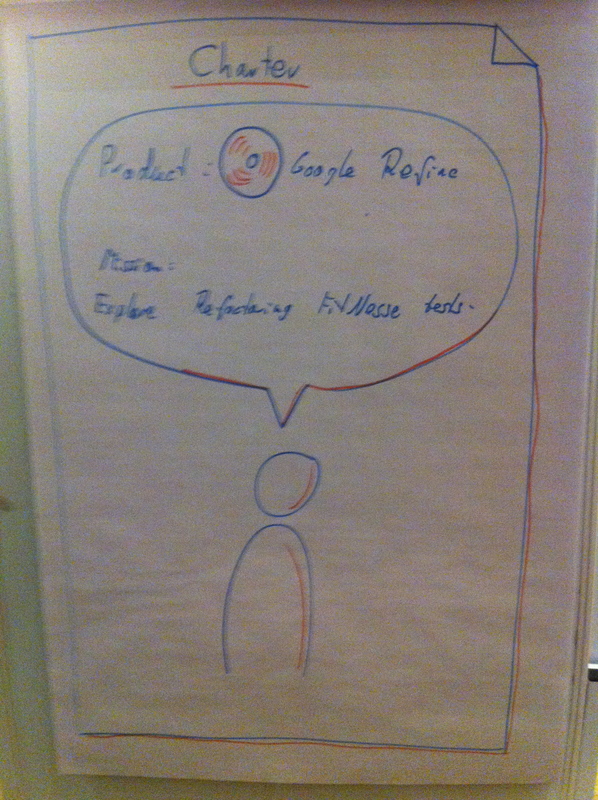 We explored FreeMind, XMind and Text2Mindmap for a test manager, a book author, and a conference speaker. 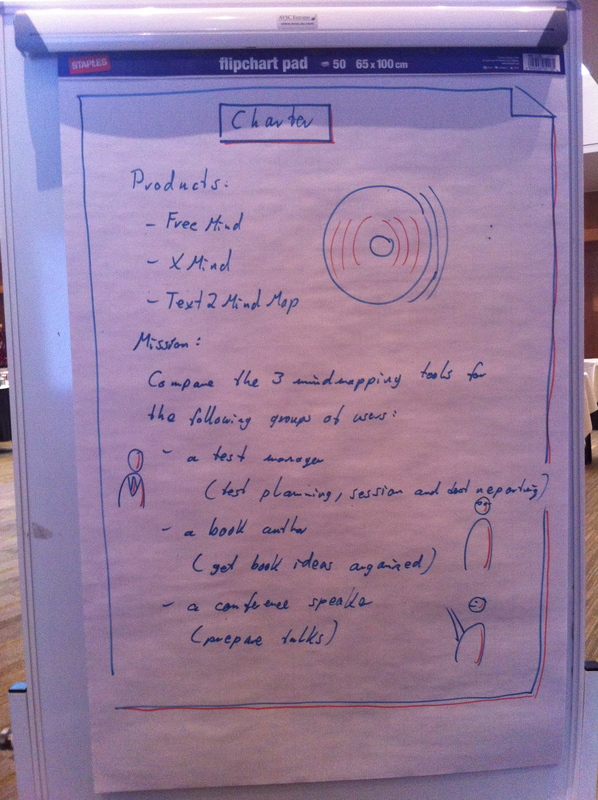 The two testers in the morning started with a brief overview to the three tools. 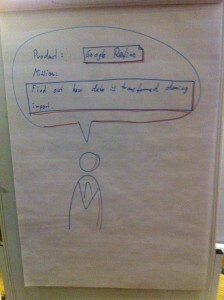 Then, in a second round, they started to evaluate the tools for one persona at a time. At noon they had just finished exploring text2mindmap for a conference speaker, and found it awkward for data export and import. If the conference was going to make some adaptations later, he would loose formatting options. Unfortunately for the test manager and the book author the pair did not get beyond this. Over lunch Lisa Crispin wanted to attend one Testing Dojo. Since the program was certainly too good, lunchtime was the only opportunity for her on the second day. We set together to plan a house using the Planning Wiz. We played around with some of the existing layouts in order to plan a house. What we found awkward was that the walls and the objects did not snap together. So, whenever you changed a wall layout, you also had to readjust the whole layout around it to match the new size. This certainly becomes tedious in the long run. In the afternoon we explored note taking tools. We started with Sesison Tester, Rapid Reporter, and BB Test Assistant. 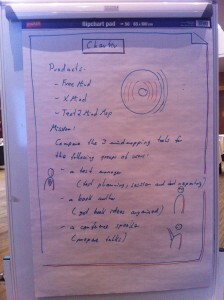 One of the participants also suggested the free WebEx Recorder (can’t find the link), which we also explored then. The former two are merely helpful to take some session notes, similar to notepad with timestamps. The latter two offer screen capture and replay abilities storing whatever happens in a video file. This part was the best attended on the whole two days, and we had some lively discussion regarding the different tools. I plan to put the insights from these discussions in an article in the near future. There were just few attendees, though. I think this speaks for the fantastic program of the conference which people preferred to visit. On the other hand I have some new insights and some new ideas what to try out in the future. One idea that certainly strikes me is to combine Testing Dojos with the idea of Weekend Testing. 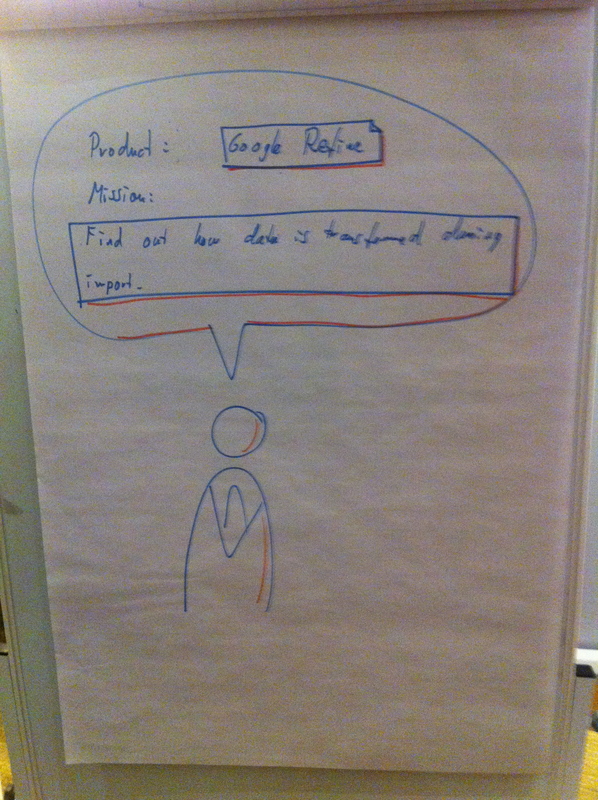 Not only did I have this idea before the conference, but also one of the attendees pointed this idea out. 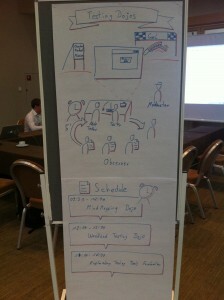 The idea is to have each pair bring a laptop, and then go for a timeboxed session of testing. After the timebox the attendees go for a debrief, where individual strategies and experiences are exchanged in the group. 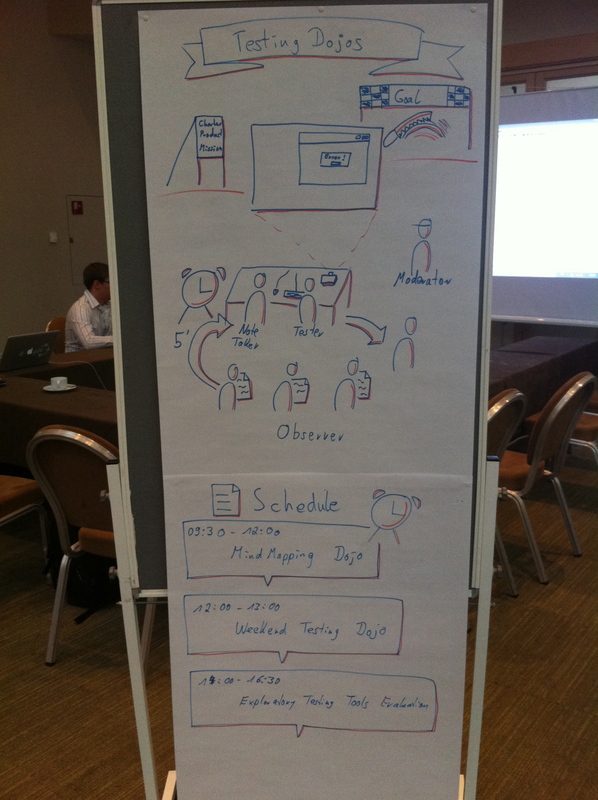 Currently I plan to facilitate at least one session at the Agile Testing Days in this way. Thanks again for all the attendees. I hope you enjoyed the dojos as much as I did. And I really look forward to your experience reports as well. Good write up, it’s a shame so few got the chance to attend. I’d loved to have gotten the opportunity myself if I was there. Hopefully if my work lets me attend EuroStar in Manchester this year, we’ll get the chance to attend the test lab together and exchange ideas. I really enjoyed the limited time I had to spend at the Testing Dojo area. As always, I learned a lot from you, Markus! I am inspired to try a Testing Dojo for our local user group. It’s like Open Space at regular conferences, it’s hard for people to tear themselves away from conference sessions. I’d love to see conferences devote a timeslot just to testing dojos. Once people know the value, they’ll be happy to have discovered dojos. I was thinking the same thing Lisa, having a dedicated dojo session. Then I was trying to think of why not to do it and couldn’t think of anything! I know people get a lot from the talks, but you can’t beat sharpening your testing skills on something new, or even better still observing someone else and how they approach these challenges. That’s why Markus is so lucky here, as he gets to reap the benefits of observation. Some people underestimate the benefits of that a lot. 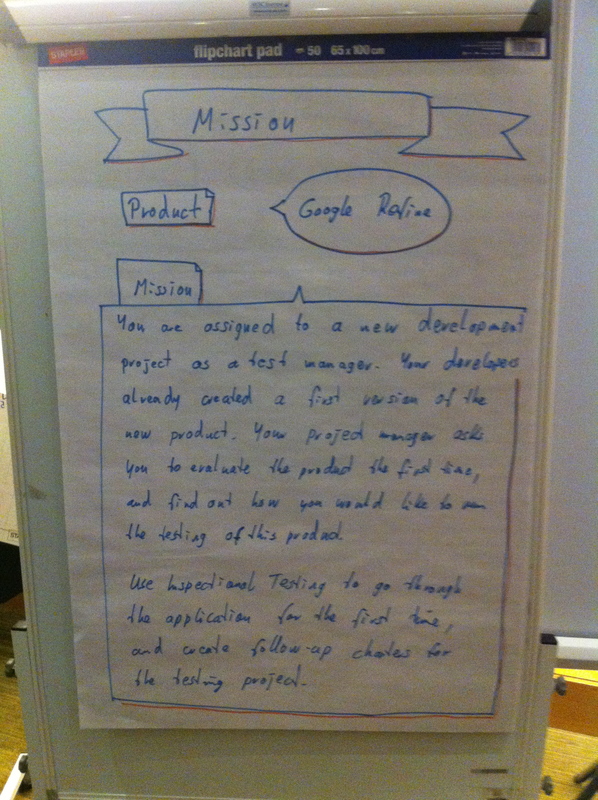 Oh, and that of course is why a Testing Dojo offers some insight for participants as well. While observing how two people interact with each other, and exchange ideas, helps yourself to see ways to communicate your intent, and frame why you ran this test as well. On trying Testing Dojos in your company, I can just recommend to test the waters, and adapt as you see fit. I really enjoyed the Testing dojo and I learned a whole lot! I benefitted the most from watching experienced testers, especially Lisa and Jan de Wael, and from their reflections of their work. It was really fun and very effective. I’m definitely going to attend your dojos again in the future. I look forward to see you at a Testing Dojo session soon. Hope some more will join in. Could you share more what have you learned from Testing Dojos? I’m thinking about organizing such an event with our local test group and I want to make sure Testing Dojos can help improve testing skills, not just solve abstract problems. Few weeks ago, I’ve set my first steps on the dojo to exercise on Martial Arts. The sessions aim for a balance between your mental power and physical techniques. 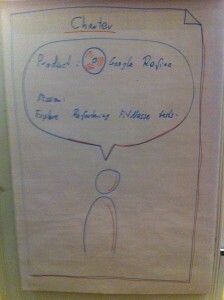 I found similar interaction between Thinking and Acting on your Testing Dojo at the Belgium Testing Days (the Mindmap case). Even with the small set-up of a simple charter, a few people and a time-boxed session, I learned effectively on how I actually do a testing job. Look forward on the first testing dojo with my own test team. 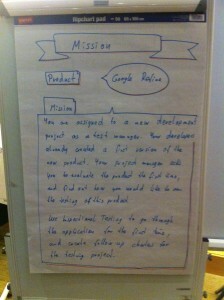 a while ago i learned about this idea for developers. This form of collaborative excersise Testing Dojo must be very effective, as the respondents here point that out indeed! I ‘m looking forward to participate in a Testing Dojo some day. I was wondering that there is no registration form in Testing Dojos site. Can you help me in getting registered to it? And if there are any special requirement to be a member of the community. the Testing Dojos site serves as a general information site. I know that Agile Finland runs Testing Dojos publicly quite often. I am not aware of other places holding a regular Testing Dojo. If you want to found one, and have some questions left, please drop me a line. I’ll be more than happy to help you out.